» Mobile Herders or Teenage Warriors from the Steppe? Home > Museums & Discoveries > Mobile Herders or Teenage Warriors from the Steppe? Mobile Herders or Teenage Warriors from the Steppe? Gene Studies Show Sweeping Central Asian Influence on Bronze Age Europe and Altai. 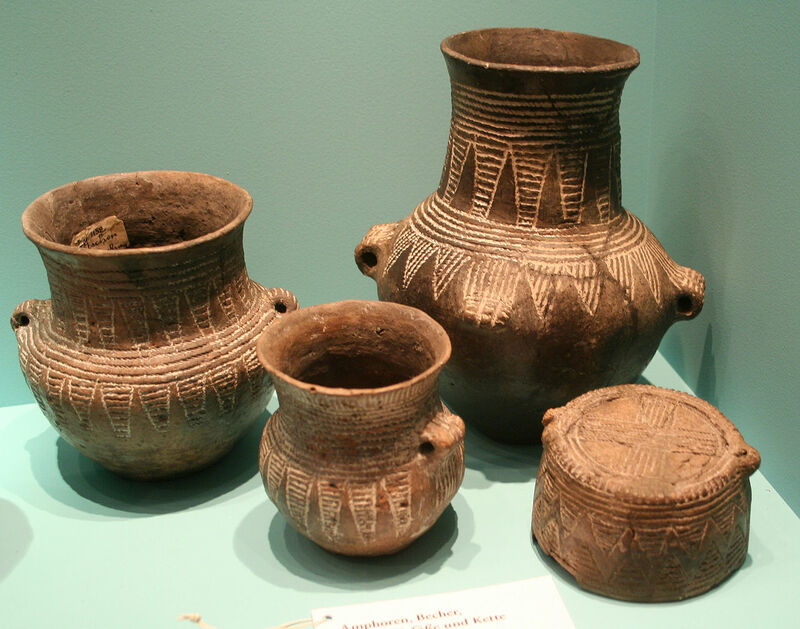 By Einsamer Schütze Corded Ware pottery in the Museum für Vor- und Frühgeschichte (Berlin). Ca. 2500 BCE. Evolutionary geneticists Reich of Harvard and Eske Willerslev at the University of Copenhagen, conducted the two independent 2015 research studies that contributed to the new understanding of Yamnaya migration and its effect on Bronze Age culture. They extracted DNA from a combined total of 195 skeletons from northern and central Europe. These individuals had lived between 4,900 and 4,400 years ago. Overall, about 75 percent of the extracted genetics were derived from the Yamnaya. Originally from the steppes of the Caucasus and Ural regions, the Yamnaya pushed north and west into present day Europe, and east into the Altai, where they remained until 200 years ago. The Yamnaya mass migrations from 5,000-3000 years ago changed the shape of Bronze-age culture and have left distinctive genetic traces – and perhaps linguistic influence from the Indo-European languages in distant reaches, from what is now western China to the Atlantic Ocean. Though it is not known why the Yamnaya undertook such long migrations, one theory is that an extended lack of rainfall in their grazing lands prompted them to move to greener pastures. What we do know is that they mixed with the farmers and hunter-gatherers of the existing Corded Ware culture in European lands – named for the distinctive patterns in their pottery formed by pressing cord into the damp clay. 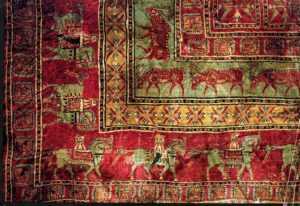 The pile carpet from chieftain’s burial in the frozen tombs at the Pazyryk kurgans, Altai mountains, excavated by Sergei Rudenko, now in the Hermitage, St. Petersburg. 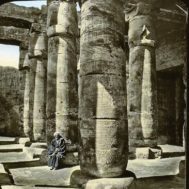 Early centuries BCE. The Yamnaya’s hybrid way of life may have enabled them to adapt rapidly to changing circumstances. They lived by a combination of activities that included crop cultivation, breeding livestock and some hunting and gathering, The Yamnaya used the recent inventions of the wheel and horse drawn cart in their herding activities and to transport themselves and their goods into new regions. 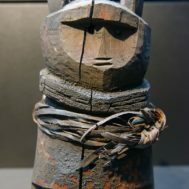 They brought characteristic social patterns to Europe and the East: they are known for burying their dead curled up in a fetal position, buried with objects from their life, beneath mounds – or stone kurgans in the steppelands. Other DNA testing has found that the Yamnaya were lactose intolerant, were fair skinned, and had blue or brown eyes. There are many theories why the Yamnaya were so successful in mixing with the existing European populations, as other groups of pastoralists do not appear to have had the same measure of success. A series of epidemics that diminished the size of the pre-existing European Corded Ware population may have paved the way for the Yamnaya movements into Europe. The appearance of the Yamnaya newcomers may have presented an opportunity for the Corded Ware to reestablish their populations. Another theory, more alarming but no less successful a model for regenerating populations, is that the Yamnaya initially arrived as waves of teenaged warriors who took wives from among the populations where they traveled, leaving their mark on the gene pool up to the present day. This theory may be strengthened by the preponderance of male DNA in some of the analyzed skeletal remains. 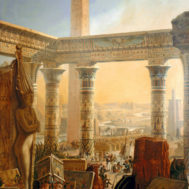 The dramatic results of the studies should spur additional genetic research; all involved have agreed that the DNA evidence has enabled a far different and more developed picture of the Bronze Age than previous linguistic or archaeological studies made possible. Archaeologist David Anthony of Hartwick College in NY told Science News’ Bruce Bower, “We never would have known that Yamnaya people produced two distinct cultures by looking at archaeological finds alone,” since there was nothing to show that the Yamnaya has previously made Corded Ware pottery or battle axes.